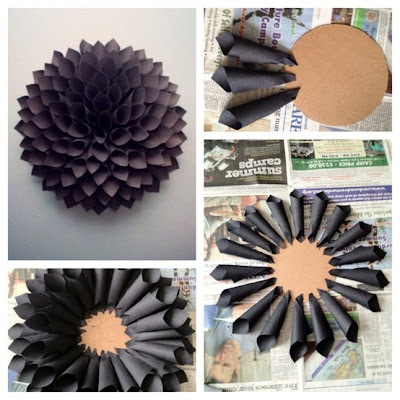 We can make this flower with paper and cardboard to decorate a birthday party or wedding or to decorate our reading corner or room in which we do our crafts. The materials are few and recyclable. What better to do craft taking care of our planet! This work does not require much explanation, it is simple and easy to do. It is a craft you can make with the help of our small or let them prepare their own flowers to accompany ours. As a first step we have to mark the base of our flower carton. To do this you need help with compass. Short and you can start working. Regarding the paper should be cut into squares, measures again depend on the size of flower that we will do, but a good average size is 10 x 10 inches. Before stick it on the cardboard base, we build small tubes as those seen in the photo and glue around the edges so it will not disarm. Is that the amount you use glue to stick it in the paper is not curled when replacing it. When you already have the armed paper tubes, it only remains to put glue on one end and begin to glue on the cardboard base in a circular. Flower slowly begins to take shape and you will be as pretty as this.